It looks frigid in this photograph taken Tuesday afternoon in Hillsboro, and the National Weather Service said that Wednesday and Thursday will likely be even worse. 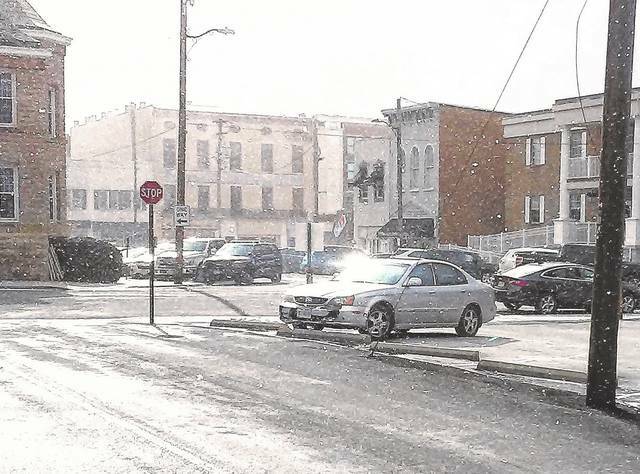 The National Weather Service was expecting Highland County residents to wake up to temperatures around zero Wednesday and Andy Hatzof, a NWS staff meteorologist, told The Times-Gazette that Thursday won’t be much better. He said wind chill warnings are in effect until 7 p.m. Wednesday for southwest Ohio including Highland County, with the temperature feeling like minus 30 degrees to minus 35 degrees on exposed skin, and Wednesday’s high is forecast to only reach 5 degrees. It’s all due to a second arctic cold front influenced by the infamous “polar vortex” that arrived late on Tuesday, Hatzof said, and temperatures will rebound only into the upper teens on Thursday. The expression “polar vortex” is a scientific term used to describe the general counter-clockwise circulation of air at the north pole, Hatzof said, and when something disrupts it’s flow pattern, cold arctic air migrates south into the mid-latitudes and triggers the extreme cold temperatures the area is experiencing. With the low temperatures and wind chill values forecast for Wednesday and Thursday, he said the most important thing to be safe is to minimize the amount of time spent outside and to dress in layers, making sure that no part of the body is unprotected since frostbite could occur in less than 10 minutes. He said the area schools that decided to close were wise since a two-hour delay wouldn’t mean much of a temperature difference. He said the last time Highland County experienced near zero temperatures and wind chills well below zero was in early January 2014 when the nighttime low dipped to minus 8 degrees and the high during the day only reached the upper single digits, with wind chills of minus 15 degrees for 31 straight hours. Aside from the record breaking wind chills experienced in 1978, the lowest post-blizzard readings at the Greater Cincinnati/Northern Kentucky International Airport occurred in January 1985 when the wind chill factor plummeted to minus 48 degrees.